This guide covers TOP-5 best external DVDs, how they are different from portable DVD players and the key features to look for before you buy a product. You will learn about the peculiarities of each type of this kind of device — rewriters and players. Find out what factors influence their writing speeds and why compatibility is one of the more important technical features to look at. An illustrative chart will help you compare the most popular products. If you have a laptop that does not have a CD or DVD drive built in, like many of the newer models, and you want to watch some movies or burn a CD, then you might want to consider an external DVD drive. They have been around for many years now and have grown in popularity recently because of the high demand for them. They can be easily found online, but they are not as common to find in an electronics section of a supermarket. If you would like to see one in person before you buy it, try your local computer store. Before you go out and start searching, there a few things you should know about them that could stop you from spending your money on a product that does not work. How does an external DVD drive work? 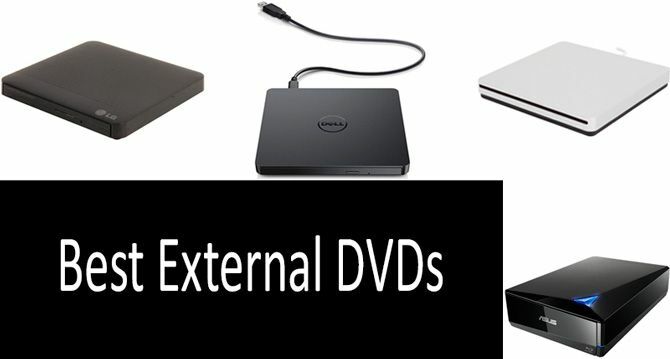 What are the types of external DVD drives? External DVD drives are similar to portable DVD players, but instead of having a screen of their own, they are connected to a laptop through a USB port, and the disk is displayed on the laptop's screen. They can do other things as well, and many are compatible with many different laptops. Rewriters and players are the two main types of DVD drives. A DVD player reads a DVD or cd that is in the external drive and plays it through a media viewing program like Windows Media Player or iTunes. A DVD writer takes a blank cd or DVD and writes over it with selected files. This process is commonly referred to as burning onto a disk. While some of the older external DVD drives use to only be one type, a rewriter or a player, multi-purpose drives are becoming more common now. This means that some drives can both play or rewrite, but they tend to be a little more expensive than single-purpose external drives. This can be a little complicated, but most external DVD drives rate their speed in "x"s. For example, burning a DVD with a drive that has around 4x speed takes around 14 to 16 minutes while a driver with 16x speed takes around 6 to 7 minutes. The x's are almost pointless since factors like disc type, how it is being burned, and the drive's capability all factor into the process's speed, either increasing or decreasing it. There is also the read and write speeds that should be looked at, although this is less technical. Typically, external DVD drives that connect through a USB 3.0 drive are typically faster than those connected through a USB 2.0 drive, but they are usually more expensive too. Since they are highly used by travelers, smaller and lighter models are generally more preferred because they require less space in carry-on bags, purses, backpacks, and more. However, if you are planning on using it at home, picking from any size and weight driver that fits your preferences lets you have more of a selection to choose from. This is more of a subjective choice for travelers. If you are planning on carrying around the driver in a bag often, then you might want to go with one of the lighter choices that are under a pound or even less. Otherwise, if it will be stored somewhere where the weight will not be an issue, you could choose from any drives you like without the worry of weight. This can be hard to determine both online and in stores since the only real way to test how resilient the driver is by having it in a situation that might damage it. Fortunately, it is relatively easy to find online reviews of previous shoppers and their experiences with how strong the driver is, which you should strongly consider if you are wanting a driver that will not get damaged while you are traveling. This is one of the more important technical features to look at since it would be a complete waste of time and money to buy a driver that will not even work with your computer or laptop. Most of the modern external drivers are usually compatible with Windows 7, 8, 10, Vista, and XP as well as Mac OS X 10.6 or higher, but some have less or more compatibility choices. Below, you will find a review of TOP-5 best products at a price ranging from $40 to $200. Apart from different compatibility, these models also differ in play and write speeds. In addition, you may choose between various designs and sizes so that you could find the best option for you. The largest of all of the products on this list, this external DVD drive is also one of the ones with its sleek and high-quality appearances and functions. With a transfer speed from the USB 3.0, it is several times faster than the cheaper models that use a USB 2.0. Because it is one of the larger models and it is one of the most expensive, it is not that popular compared to some of the other models. True, it is certainly higher quality, but for travelers, the size and price make them too inconvenient to not think about them. This model is not only one of the more popular choices for travelers, but it is also one of the cheapest and one of the smallest models out there now. Unlike the last product, this model is connected via a USB 2.0 cable, not making it as fast. Despite being a slightly older model, the quality is on par with some of the newer ones since it is relatively sturdy and long lasting. Some customers say that as long as it is properly cared for, it can last several years or longer. One particular feature it has is that it is powered by the power of the laptop, requiring no space or need for a power cable. Because of this, many people who are planning on flying on an airplane or taking a train prefer this model. Even though it is one of the cheaper models, it is not as popular as some of the others because of its slightly slower speed. That, and there are a few products out there with higher specs that cost less or slightly more. A unique characteristic of this product is that it is mostly white, unlike the others that are either black or gray. Slightly more expensive than the first product, this Apple external DVD drive is one of the few drives out there where the cable is built into the drive itself. Most of the other products have detachable cables so that when they are not in use, they can be stored easier with less tension on the cable. This external DVD drive comes with something very few other products normally do, a stand so that it can be sitting vertical and not laying horizontal beside the laptop. It also has a more rare color like the Apple model above except this product is silver and not white. Being able to be connected with either USB 2.0 or USB 3.0 cables, it is no wonder that this model is one of the most expensive currently on the market, being several times more than the cheapest one on the list. Which external DVD drive is the best? Out of the top 5 that are above, there are a few things that make the LG Super-Multi Portable DVD Rewriter the best out of all of them. The first is the weight and size because it is one of the smallest and lightest out there, taking up less space and being super convenient for travelers. The second is its speed since it is one of the faster models. Another is that is has a very wide range of compatibility with different operating systems. Finally, it is one of the more affordable models and can even play Blu-ray discs. Other than that, the only major con is that it has a USB 2.0 connection, not the higher quality 3.0, but this is made up through a less expensive cost. Can it be used for TV? Since they are usually connected through a USB port, most, if not all of the models of external DVD drives would not work with a TV, even if it was a smart TV. However, if it is hooked up to a laptop and the laptop is connected to a TV through an HDMI cable, it can be displayed through the laptop to the TV. What is the best external DVD for Mac? It is hard not to be biased towards certain products, but many people think that Apple drives work better with Macs than other generic drives do. Going off of the list above, the one better for a Mac would most likely be the Apple SuperDrive. How to use it on Windows 10? When the device is first plugged into the computer, a notification should come up that a new driver is being recognized and installed. From there, the computer will present a set of instructions to get the device setup unless it is done automatically from the computer. If no notification comes up, open the control panel on the computer and check 'devices and printers'. If you do not see the driver there, there may be an issue that Microsoft tech support can help you with. After that, your computer may need a program to installed that can work with the driver to play the media or write the disk. It depends on if the external DVD driver itself requires a specific program or if your computer does not have any programs that are needed to work with the driver. Can an external DVD play games? Since this can be a hit or miss with certain external DVD drivers, look up the product you are interested in and see if it can run a disc game. If it does not state that it does, it most likely will not, but you could always contact the manufacturer or seller and ask. Each place is different, but they will try to get back to you within a few days. One of the largest pros they have is that they are extremely convenient for use with laptops that do not have CD or DVD drives that are built into them, especially when traveling for longer periods of time. Another pro is that they are very easy to carry around and can be packed in something as small as a medium or large purse. A third and rather important pro is that they can be used with multiple computers and shared as long as they are compatible with the operating system of the computer. This is ideal for families and business that use laptops without CD/DVD drives that do not want to pay for multiple external drives or are limited to buying one or two. One of the few cons is that they are more expensive than buying an internal drive and installing it into the computer, usually. This can vary depending on the type of computer and the cost of labor unless you are experienced and are doing it yourself. Another less popular con is that they take up extra space especially in terms of wire and cable management with the power cord and USB connection cord. While this is a valid point, it is subjective because not all external drives are the same size. Now you know what external DVD drives are, what they can be used for, the TOP-5 on the market right now, and more. If you follow most or all of the steps and tips to buying and using them, you could be watching hours of your favorite movies or tv shows or burning custom CDs of your favorite bands and songs very soon. There is some talk about future external DVD drives that are connected by either HDMI cables or USB (2.0 or 3.0) and HDMI cables for people who want the ability to use it with their laptop or TV. This is just mainly talking between some consumers at this point, but with how popular high definition is getting and the growing demand for it, it might be a possibility within the near future.